Bathing is more than skin deep. Have we met? If so, there is a very good chance that I have already waxed poetic about a salt bath and why you should take one. Bathing as a ritual and a healer is a very old practice. The Romans did it, the indigenous peoples did it, and you should do it too. I LOVE taking baths. 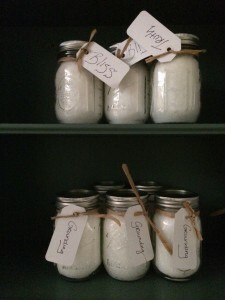 Typically, I bathe in Epsom Salts as they are an affordable luxury and incredibly versatile. Read the back of the box and you will see that there are many other reasons to use them. Strangely enough, they are so amazing that even the Wall Street Journal is on board. Yesterday the UPS deliveryman was lucky enough to carry 20 pounds of Epsom Salts to my third floor walk-up. To give you a perspective on just how much salt we are talking about here – the kind you buy in the store is one to two pounds. This is the first time I have ever ordered salt in bulk and when I saw it I was so excited that I clapped. This weekend I am teaching a three-day training on the Energetic Aspects of Teaching in Delaware. During this training, I ask participants to practice a salt bath ritual for the three days we are together. My hope is that it will inspire them to continue to utilize this simple and effective tool for healing, release, and renewal. First, I sing a song for the duration of my “work” – sometimes this song is a traditional mantra sometimes I make-up a song of healing and light. 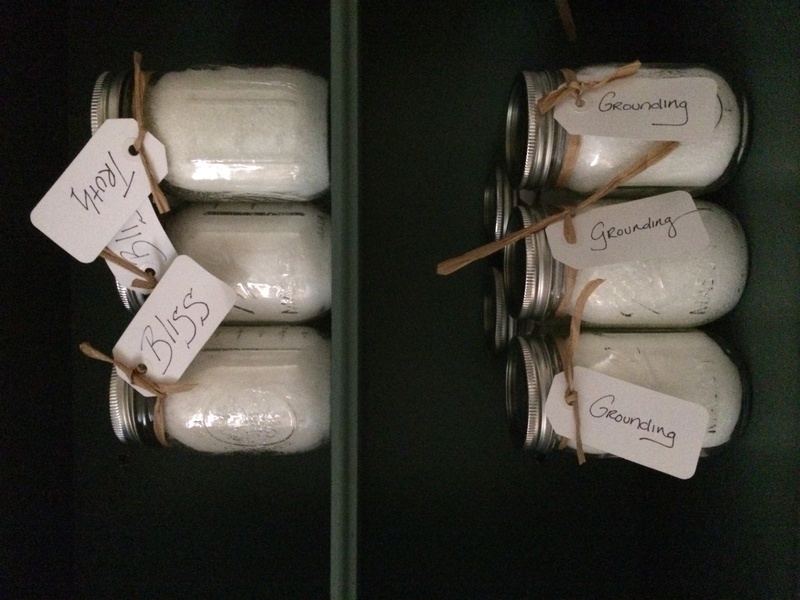 Second, I mix the Epsom Salts with Baking Soda at a ratio of 2:1 in a stainless steel container with a stainless steel utensil (pottery, wood, and plastic can absorb the essential oils). Third, I stir these two simple ingredients together and imagine them filling with white light. Fourth, I add a generous amount of essential oils (this time three different blends are being crafted for the three nights – Sweet Orange and Cedar Wood for grounding; Rosewood, Lavender, Rose, and Geranium for protection; straight Lavender for release). Fifth, I infuse the salts with Reiki energy to intensify their healing properties. Sixth, I write a word of meaning on the envelopes they will be packaged in (no laser printer in sight). Seventh, I put the salt in little bags. Then seal them in their individual envelopes and place them in the carrier bag. I always give the salt away at very end of our practice. As every one rests in savasana I move through the silent room and gift each student. As I place their envelope I take that moment to wish them well, happy, and free from suffering. Personally, I utilize a salt bath ritual after I teach in order to release the energy of others and bring myself back to center. During my daily ritual I take time to simply breathe and relax. I have found over the many years I have been teaching that taking this time for myself to reset, after holding the space for others to heal, enables me to remain clear, centered, and grounded. I hope you try for yourself – I would love to read your thoughts below! *If you are pregnant, have a medical condition, or are allergic to magnesium sulfate, please speak to your doctor before soaking in salt.